If you’re an entrepreneur, you always have money on your mind. How much can you save, and how much can you spend? The trick is managing your costs, keeping your profits, and making the best investments. Short of going on Shark Tank and trying to solicit capital from Mark Cuban, how do you get the startup money you seek to increase your business, and a move into a metal building? When you investigate all different types of buildings (don’t worry, we encourage you to do so) you’ll find that one of the only downsides to metal buildings is they have trouble naturally staying warm or cool. So that means you’ll need insulation with a good R-value. You’ll most likely want a climate control system for your building if you plan to turn it into an office. However, if you plan to use your building as an auto shop, sign shop, recycling center, factory, self-storage unit, or any type of single building retail space with multiple doors, you might not need insulation or a climate control system. That’s the most basic way to save on your energy costs. Also, rigid framed metal buildings are much more energy efficient than wood framed steel buildings. The greater the chance that a building will collapse or need repairs, the more it will cost to insure. Since metal buildings are extremely capable of resisting damage from earthquakes, snow, fire, high winds and heavy rain, they are much easier to insure. In fact, several insurance companies might offer special rates and discounts for buildings that utilize steel rigid frames. While insurance premiums vary from buildings in different settings, small business owners routinely choose steel for the possible insurance costs savings compared to other building constructions. Many steel buildings require some kind of foundation, whether it is a concrete slab or a pier system. Little did you know, that foundation, even with the cost to pour it or create it, is going to put some green back in your wallet. Look at pole barns for example. Many pole barns have poles that go directly into the ground. There is no foundation to stand on. Therefore, most city and county permitting offices don’t consider pole barns to be permanent structures. Non-permanent structures usually won’t appreciate in value over time, and might actually depreciate in some cases. 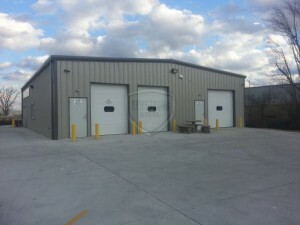 If you want to expand your business in the future, a metal building is easily expandable. Instead of paying for an expensive remodel, just remove an endwall and expand the building. While you won’t want to completely ignore your steel building for the next 50 years or more, you’ll be happy to know that a metal building requires little maintenance over it’s lifetime if erected correctly. While paint from a wood building will crack or chip, you won’t need to paint a steel building’s exterior every few years; the coatings will last for decades. As far as the inside goes, you won’t need to treat your rigid frames with chemicals on a regular basis to eliminate or reduce the risk of termites and insects. Termites might gobble up wood frames, and that’s an expense you’ll have to pay to replace those trusses, rafters, and poles. In addition, steel doesn’t support the growth of mold. Rest assured, as long as you control the moisture in your business, you won’t have a visit from any mold, fungi, or mildew in the building. That will ensure your employees stay healthy, and you won’t have to interrupt your business to spray or disinfect your structure. Lastly, keep in mind that while steel will bend slightly (known as deflection), it will not split, warp, twist, or rot like a wood building will over time. You don’t run the risk of your roof sagging, or your doors and windows loosening in its framed openings. The best part: these are the tacit expectations of every metal building. Can you think of any more ways a metal building can help your company keep its profits? Let’s start a conversation! 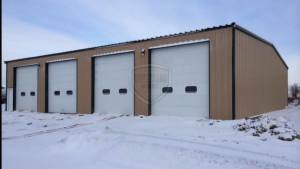 I never would have thought that metal buildings would have lower insurance costs, however, you talk about how since the building is made from such durable material, it is less likely to collapse and less of a risk to insure. Overall, I think that this is really great for two reasons. First, you are saving money on coverage that you need to have, and second, this will also save you money on maintenance and rebuilding repairs, too, because you won’t have to do it as often. Thank you for sharing!